The canals of Wuzhen have led to it being nicknamed the "Venice of the East"
Wuzhen (simplified Chinese: 乌镇; traditional Chinese: 烏鎮; pinyin: Wūzhèn, Wu: Whu-tsen lit. "Wu Town") is a historic scenic town, part of Tongxiang, located in the north of Zhejiang Province. 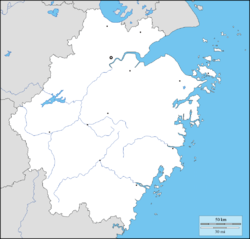 It lies within the triangle formed by Hangzhou, Suzhou and Shanghai. Covering an area of 71.19 km2 (27.49 sq mi), Wuzhen has a total population of 60,000, of which 12,000 are permanent residents. Located in the centre of the six ancient towns south of Yangtze River, 17 kilometres (11 mi) north of the city of Tongxiang, Wuzhen displays its history through its ancient stone bridges, stone pathways and delicate wood carvings. Mao Dun, a renowned modern Chinese revolutionary writer, was born in Wuzhen, and his well-known work, 'The Lin's Shop', describes the life of Wuzhen. Mu Xin, a contemporary poet, calligrapher and painter, was born and died in Wuzhen. The Mu Xin Art Museum in the city is dedicated to his work. Originally built in the mid 19th century and covering a total area of 650 m2 (7,000 sq ft), the former residence of Mao Dun, was the Mao family home for many generations. In 1984, the building was renovated and extended to cover a total area of 1,731.5 m2 (18,638 sq ft), opening to the public one year later. In 1988, it was listed as one of the Key State Preserved Relic Units and in 1994 was renamed the Mao Dun Museum of the City of Tongxiang. The house has three exhibition areas: 'Wuzhen, the Hometown of Mao Dun', 'the Way of Mao Dun', and 'the Former Residence of Mao Dun (renovated)'. The present Mao Dun Museum lies to the east of the residence, which was formerly the Lizhi Shuyuan (Aspiration Academy) where Mao Dun spent his early school years. The Fanglu Pavilion obtained its name from an accidental meeting between Lu Tong, the owner, and Lu Yu, the Patron Saint of Tea, during the Tang Dynasty (618-907). It is said that Lu Yu once mistakenly ate some poisonous leaves and was rescued by Lu Tong, who happened to collect tea leaves at that time. In return, Lu Yu taught Lu Tong knowledge of tea and tea-making skills, which resulted in the prosperity of Lu Tong's teahouse. At the suggestion of one guest, Lu Tong changed the establishment's name to the Pavilion of Visits to Lu, in memory of this respected scholar. Located to the south of Ying Bridge and backing onto the city river, the teahouse enjoys a broad view of Guanqian Street. The "Bridge within a Bridge" is a scenic attraction created by two ancient bridges, the Tongji Bridge which crosses the river from east to west and the Renji Bridge running from south to north that joins the former at one end. Either of two bridges can be seen through the arch of the other, hence the name. Having been rebuilt five times, Tongji Bridge is a 28.4 metres (93 ft) and 3.5 metres (11 ft) one-curvature arch bridge, with a span of 11.8 metres (39 ft). Renji Bridge, which has also undergone repairs during its history, has a length of 22.6 metres (74 ft), a width of 2.8 metres (9.2 ft) and a span of 8.5 metres (28 ft). Demonstration in the traditional workshops district display traditional crafts as the printing and dyeing of blue printed fabrics, the primitive techniques of cloth shoe making and tobacco-planing. Visitors may operate the machines to get an idea of how the original work was carried out over 200 years ago. The local houses here are decorated with carved wooden and stone doors and windows. The bridge is designed to evoke the full moon. These bridges look especially beautiful on a full moon, when the moon is reflected in the water underneath the bridge. ^ Seale, Shelley. "The Water Town of Wuzhen: The Venice of China". Go Nomad. Retrieved 21 November 2014. ^ "About Wuzhen". Wuzhen Town. Retrieved March 7, 2011. ^ "World Internet Conference". World Internet Conference. Retrieved December 16, 2015. ^ "Wuzhen – Tongxiang". My “Travel in China” Guidebook. Retrieved 2019-03-23. Wikimedia Commons has media related to Wuzhen. This page was last edited on 23 March 2019, at 04:30 (UTC).